Every season presents great opportunity to add key pieces to your wardrobe. These key pieces are the building blocks that take you from looking good to looking great. What makes an article of clothes a “key” piece? Typically they are simple in that they can be worn with many options –and the key part is in the fit and the fabric. These are the clothes that are luxurious and incredibly flattering. They can help pull any outfit together. Over the holidays I found the designer Khaite at The Line – a pop-up in Chicago that is a concept store that mimics an apartment where every incredible item is for sale. I fell in love with three pieces from Khaite that quickly became my key pieces for my current wardrobe. The three pieces – a cashmere turtleneck, a modern dress, and a jean – are to die for! They look great as a whole, yet can stand alone, and even work as layering pieces with just about everything. If I had to pick 3 pieces I felt were worth the investment this year, these are it! This cashmere turtleneck is a relaxed fit that is soft and wonderfully warm. 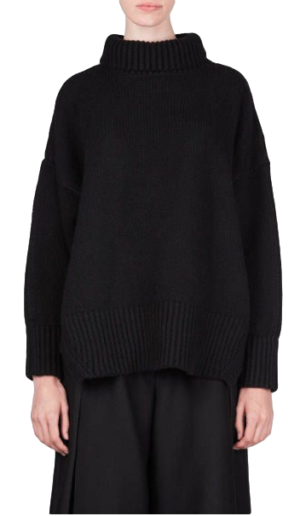 The garment is short in the front and long in the back, so it possesses more detail than a run-of-the-mill turtleneck. You can dress it up with a skirt or trouser or look more casual with a jean. Either way, this can be a go-to piece that you’ll wear a ton. The Kassandra jean is ridiculously flattering and strikes the perfect balance between skinny and straight leg. It works with boots, sneakers, flats and heels. I love the wash and the lavish button at the waist never lets you forget that you are wearing quality, high-end denim. This gorgeous silky crepe dress stands out above other black dresses because of its uniqueness. The dress is free of closures and has a deep keyhole in the back with a vented droptail hem accented with contrast topstitching. I just feel good in all 3 pieces and love how they work back so effortlessly to my wardrobe.